While Barbershop: The Next Cut’s main ambition is to make audiences laugh, its cast and crew are very adamant that they want to try and address the huge amount of gun violence that is still rife in the South Side of Chicago, which is where the comedy is set. 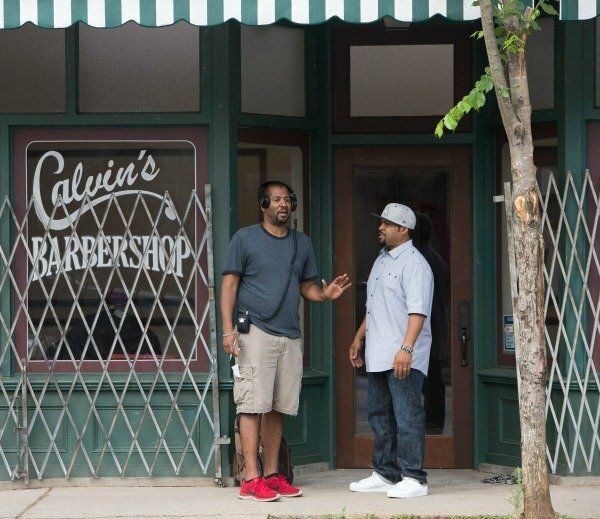 During my set visit to see the comedy being filmed, Barbershop: The Next Cut’s cast and crew opened up about how they wanted to address this real-life social issue that has so far led to 739 people being shot in Chicago in 2016 alone. So, one of the things that we’re focusing on in the film is the gang violence that’s occurring now in Chicago. As you know, the first Barbershops take place in Chicago. This one takes place in Chicago, too, and one of the things that we are touching upon, amongst other things, social things and commentary and whatnot, is the lure of gang violence, and Ice Cube’s son is one that is being recruited by the gangs, and he is having to not only protect the barbershop, but protect his son from it. So one of the things they come up with -- as a shop and as a community -- is to implement a 48 hour cease fire, which they’re going to give out free haircuts and styling so that they can, you know, get people to rally around the idea of peace. So, that’s kind of the macro. The barbershop saves the neighborhood, [that] kind of a flavor. Malcolm D. Lee added that Barbershop: The Next Cut, while certainly a comedy, looks to discuss the decline and turmoil of the Chicago inner city and how the neighborhood of the film has deteriorated and become overrun by gangs, which leads to murders being committed on a weekly basis. However, while making the threat of danger in the community prevalent, Malcolm D. Lee also wanted to infuse it with the same colloquial humor about politics, sports and everything in between that made the original films so unique and appealing. Cedric The Entertainer, who is reprising his role as Eddie from 2002’s Barbershop and 2004’s Barbershop 2: Back To Business in The Next Cut, echoed Malcolm D. Lee’s comments, insisting that he believes the film has a very real chance of providing a commentary in an entertaining fashion. The writers wanted to talk about one of the main themes in this movie, which was the violence of the young folks of Chicago, and how willing they are to just kill each other. And so, it seemed to be really out of hand, and nobody was able, from the government on down, the mayor, nobody really knows how to talk to these guys, and give them any kind of a voice or anything. Cedric The Entertainer believes that the casting addition of Common to the Barbershop ensemble brings more integrity to the film’s ambitions, too. That’s because not only does the 44-year-old hail from the South Side of Chicago, but, in Cedric’s own words, he is also "a credible young voice in the world today who speaks out and stands up and you believe him to be truthful." When we sat down to talk with Common about working on Barbershop: The Next Cut, he admitted that he was instantly drawn to the project because of its message, especially since it was set in Chicago. I was truly drawn to it, because it was a Chicago story, and I felt like, as much as its a comedy, its still tying in with getting the message out about, there’s something going on in the city, and really a lot of cities, but there’s something going on in the city of Chicago and it’s a bad situation. One thing I always thought about... great comedies, great stories, always still have some substance to them, and some heart to them. And I felt like, when I was reading the script, I was like, yeah, you know when you’re on the airplane, you start getting teary eyed. You’ll get to see for yourself just how well Barbershop: The Next Cut addresses these issues in only a few days time as the comedy will finally be released on April 15.